Kubodera, T. (1991) Distribution and abundance of the early life stages of octopus, Octopus dofleini Wülker, 1910 in the North Pacific. Bull. Mar. Sci., 49, 235–243. 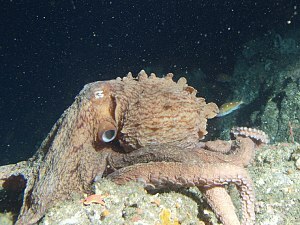 Marliave, J.B. (1981) Neustonic feeding in early larvae of Octopus dofleini (Wülker). Veliger, 23, 350–351. Gabe, S.H. (1975) Reproduction in the giant octopus of the North Pacific, Octopus dofleini martini. Veliger, 18, 146–150.